This guide will instruct you step-by-step on how to set Chartboost live as an Ad Network on the ironSource Mediation platform. Make sure you have correctly integrated ironSource’s Rewarded Video or Interstitial into your application. Create an account with Chartboost. You can do so here. Once your account has been verified you can login at their partner login here. Already set up your application(s) at Chartboost? Skip to here. If this is your first time setting up a Chartboost account, continue below. 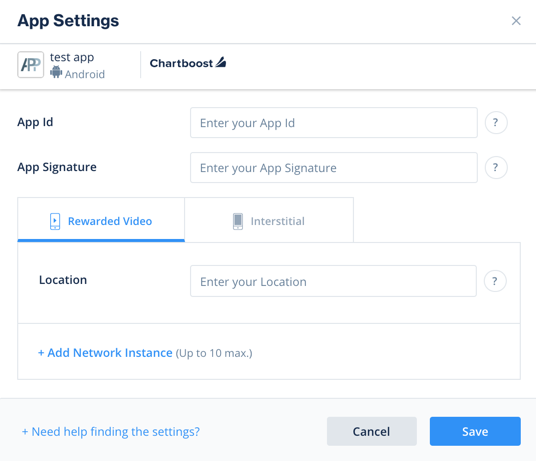 Chartboost will automatically try to identify your Applications in the Appstore based on the company name you provide in the sign-up process. If this process is successful, simply select the applications you want to run ironSource’s Mediation on. Note: You will need a unique Chartboost application per platform (iOS + Android) just like you do with your ironSource account. Now you must select the ads you want to serve in your app. You will be re-directed to the below page where you will find a summary of your newly created Apps. You will specifically find both the ‘App ID‘ and the ‘App Signature‘ here. These parameters should be entered into your ironSource Admin account under the ‘Network Setup‘ Module. Once you have completed the above process successfully, continue here. If you have previously set up your Chartboost account and you’re simply adding new applications to use on ironSource‘s Mediation platform, follow this section. Is this your first time setting up your application(s) on Chartboost? Start here. Platform – iOS or Android. App Nickname – Used to represent your app in the Chartboost Reporting UI. Orientation – Select ‘Landscape’ or ‘Portrait’. You will find both the ‘App ID‘ and the ‘App Signature‘ here. These parameters should be entered into your ironSource Admin account under the ‘Network Setup‘ Module. In order to serve Chartboost’s ad inventory in your app through the ironSource Mediation platform, you must create a publishing campaign on Chartboost. Within your Chartboost dashboard, click Add a Campaign in the bottom-left corner and then click Network Publishing. In the Simple Settings section, indicate the type of ad you wish to serve (Rewarded Video or Static Interstitial) in the Ad Type drop-down. Note: You must create two different campaigns if you want to serve both Rewarded Video and Interstitial Ads through the ironSource Mediation platform. Note: Campaigns may take up to 20 minutes to go live. If you’d like to define targeting options for your application, follow the instructions on Chartboost. App ID Unique identifier of your Application in Chartboost’s system. App Signature Unique signature used to validate Ad Requests to your specific Chartboost Application. Detected Location Unique identifier of specific detected location within your Application in Chartboost’s system. User ID Unique identifier for your Chartboost account, which allows your ironSource Mediation Platform to import performance data from your Chartboost account to use in reporting & optimization. User Signature Unique identifier for your Chartboost account to verify reporting requests made by ironSource on your behalf. Once you obtain this information, you must configure Chartboost’s Parameters in your ironSource Account. By adding the above information correctly, you will be able to take full advantage of Chartboost’s ad inventory and reporting data on ironSource’s Mediation platform. Once you have all these parameters, log in to your ironSource account. Add the Chartboost Adobe Native Extension to your build. You can find the latest Chartboost ANE here. To add the ANE, simply add it to your project by clicking on project properties ➣ Flex build path ➣ Native Extension Tab. Click on add ANE and choose file you have downloaded in the previous step. Make sure you mark the ANE to be packaged into your application on Flex Build Packaging ➣ Native Extension Tab, select the checkbox of ‘package‘. You are now all set to deliver Chartboost Ads through the ironSource Mediation platform!